Ronnie Milsap performing in concert. 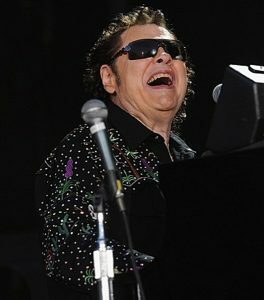 Ronnie Milsap overcame both childhood poverty and lifelong blindness to become a highly successful singer and pianist. In the 1970s and 1980s, he had an extraordinarily long series of hits on the country and pop charts that garnered him multiple awards. 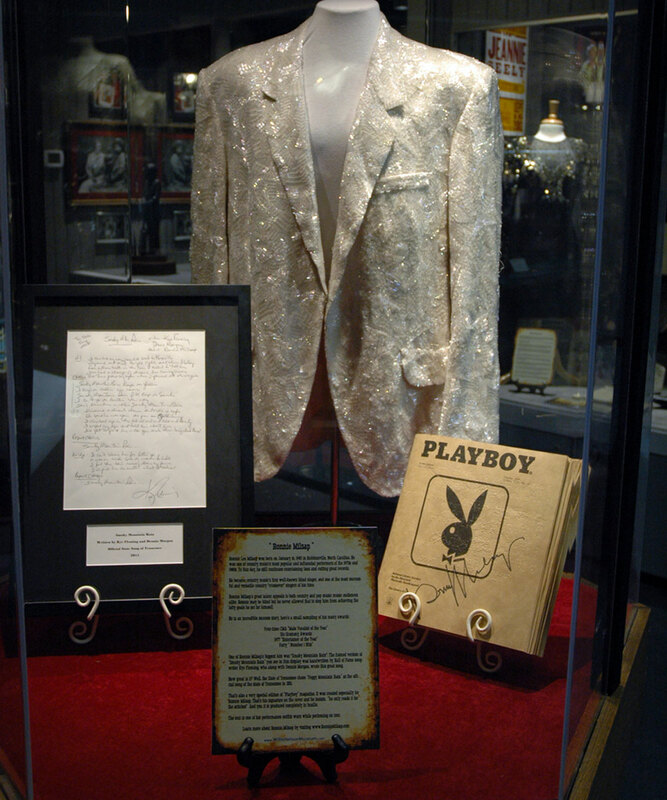 He was inducted into the Country Music Hall of Fame in 2014. Milsap’s compelling music—fusing country, R&B, pop, and rock—and exuberant personality has won him many loyal fans who continue to buy his records and attend his live performances. Ronnie Lee Milsap was born on January 16, 1943, in a poverty-stricken rural community in Robbinsville, North Carolina. He was born blind as the result of congenital glaucoma. Sadly, his condition caused his mother to shun him, because she thought his blindness was a punishment from God. After his parents divorced, he was raised by his grandparents. When he was five, his grandparents enrolled him in the Governor Moorhead School for the Blind in Raleigh. There, he was schooled in classical music and learned how to play the piano, violin, guitar, and other instruments. In his teens, influenced by the piano stylings of Jerry Lee Lewis and Little Richard, he formed a rock’n’roll band. After studying political science at a Georgia junior college, he was offered a law-school scholarship at Emory University. But he turned it down, deciding instead to follow his love of music to wherever it would take him. Milsap was encouraged to pursue his musical dreams by none other than fellow blind musician Ray Charles, whom he met backstage at a concert in Atlanta in 1963. 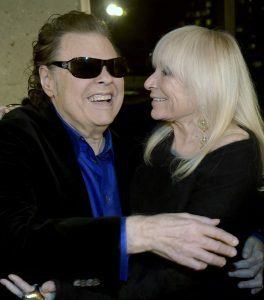 While playing with a rhythm-and-blues band in the Atlanta area in 1965, Milsap scored a minor R&B hit with the Ashford & Simpson song “Never Had It So Good.” Also that year, he married a woman named Joyce, and the couple has stayed together through the decades. They have a son named Todd. Milsap in his early R&B days, singing “Never Had It So Good” in 1965. Ronnie Milsap and Joyce Milsap attend the Ronnie Milsap Exhibit Opening Reception at the Country Music Hall of Fame And Museum at the Country Music Hall of Fame and Museum on February 5, 2015 in Nashville. By the late 1960s, Milsap had moved to Memphis, Tennessee, where he fronted an R&B band and worked as a session musician. Working with producer Chips Moman, Milsap played piano on Elvis Presley’s recording of Eddie Rabbitt’s “Kentucky Rain” and sang harmony on Elvis’s “Don’t Cry Daddy.” Both of those songs were hits in 1970. Milsap had another minor R&B hit with “Loving You is a Natural Thing” in 1970. His first album, released in 1971, met with little attention. During this time, he also played clubs in Los Angeles, where he met country star Charley Pride, who suggested he try his luck with country music in Nashville. He took Pride’s advice and moved to Nashville in late 1972. There, he got a job singing in Roger Miller’s King of the Road Motor Inn; he signed with Pride’s manager, Jack D. Johnson; and he landed a record deal with RCA. Milsap’s recording of “Daydreams About Night Things,” which peaked at number one in 1975. Milsap was named Male Vocalist of the Year by the Country Music Association (CMA) in 1974, 1976, and 1977. He was also the CMA’s Entertainer of the Year in 1977. Milsap’s recording of “Stranger In My House,” with Bruce Dees’ hard-rock guitar solo that was controversial for country radio in 1983. Milsap has always prided himself on his inventive work in the recording studio. After he bought his own Music Row studio (from Roy Orbison), he enjoyed experimenting with creative instrumental and vocal effects on his recordings. This allowed him to expand both his artistic creativity and his commercial appeal. Although Milsap hasn’t cracked the top-ten since 1992, he has continued to regularly release quality albums, as well as to keep a busy touring schedule. His 1993 album True Believer yielded the title song as his last top-forty country single. Since then, his musical journey has taken him through different genres. In 2004, he released an album of pop and jazz standards titled Just For a Thrill. In 2009, he released a double album of gospel songs called Then Sings My Soul. Country albums have included My Life in 2006 and Country Again in 2011. Summer Number 17, released in 2014, featured an eclectic collection of pop, R&B, and country standards. The album was meant to showcase the diverse musical influences that Milsap had as a teenager. Milsap singing “Mustang Sally” from 2014’s Summer Number 17. During his career, Milsap has been honored with eight gold albums, a double-platinum greatest hits album, eight CMA awards, and six Grammy awards. He was recognized by the Academy of Country Music with its Pioneer Award for 2001. He has been one of the most commercially successful artists in the history of country music. Moreover, in his incorporation of rock, pop, and R&B elements into his music, Milsap has served as an influential figure for many modern-day country artists, such as Eric Church, Billy Currington, Blake Shelton, and The Band Perry. Milsap accepting the Academy of Country Music’s Pioneer Award in May 2002. Ronnie Milsap, with Tom Carter. Almost Like a Song. McGraw-Hill, 1990.